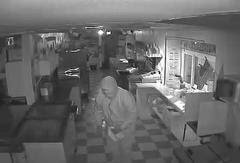 Suffolk County Crime Stoppers and Suffolk County Police Sixth Squad detectives are seeking the public’s help to identify and locate the man who burglarized a Miller Place business earlier this month. Miller Place, NY - June 26th, 2014 - Suffolk County Crime Stoppers and Suffolk County Police Sixth Squad detectives are seeking the public’s help to identify and locate the man who burglarized a Miller Place business earlier this month. A man used a key to unlock the entry door at Ralph’s Italian Ices, located a 745 Route 25A, at approximately 11:30 p.m. on June 18 and stole approximately $2,000 in cash. The subject appeared familiar with the interior of the business and location of the money. The man, who was described as white with a husky build, was wearing glasses, a dark-colored hooded sweatshirt with a white shirt underneath. He was also wearing jeans with a hole on the right rear side near the pocket, dark sneakers and dark gloves. Subject: LongIsland.com - Your Name sent you Article details of "Man Wanted for Burlgarizing Miller Place Italian Ice Shop"